Abstract: Pressure relief design for reactive systems requires a different way of thinking than standard non-reactive designs. Reactive systems are in a constant state of flux: compositions, mixture properties, temperatures, and pressures are all changing throughout the relief event. Being able to safely vent a reactive system requires careful consideration of the mixture properties before reaction, the pressure and temperature rates during the reaction, and the mixture properties after reaction. To understand how these system properties, effect the sizing of pressure relief systems requires careful experimentation, analysis and scale-up application. 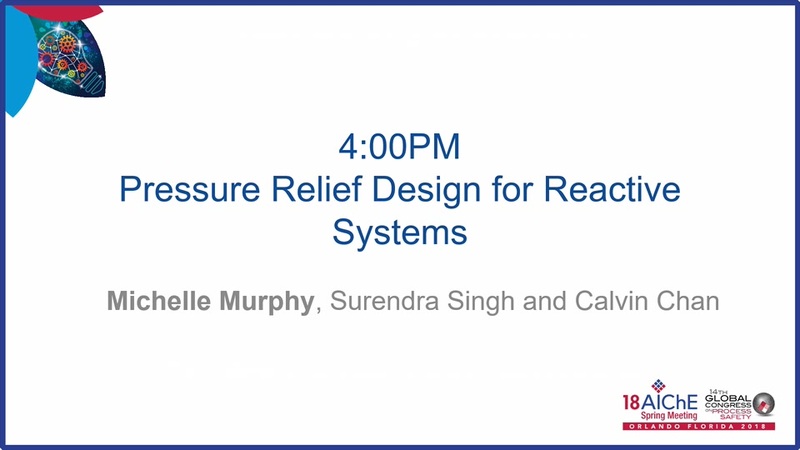 This presentation will introduce a model-based approach to reactive pressure relief system design. In this approach, we show how the vapor-liquid equilibrium of the reactants and the products are matched to assure that pressure is predicted throughout the temperature and pressure range of the relief event. An example sizing case will be presented.